This month, filmfront discusses German filmmakers Jean-Marie Straub and Danièle Huillet debut 1965, 50-minute film, NOT RECONCILED (or ONLY VIOLENCE HELPS WHERE VIOLENCE REIGNS), a movie that takes a formally radical approach to telling the story of a family of architects, the Fämel’s, trying to understand their place in Germany’s violent first half of the 20th century and the effect of Nazism on three generations. Based on Heinrich Böll's 1958 novel Billiards at Half Past Nine, the film's rigorous and highly disorienting narrative interweaves the multi-generational stories of grandfather, son and grandson, often times jumping between three different eras (The First World War, 1930s Third Reich, and 1960s Post-War Germany) in no particular order, giving the feeling of a continuous present in the lives of all three protagonists. 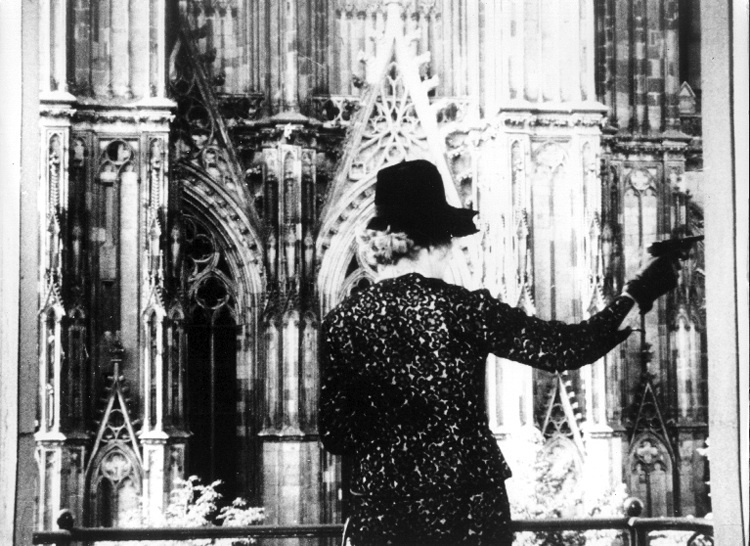 There are two constants in the film’s timeframe—the grandmother's dissidence and an abbey the grandfather built before the wars—but even these do not make it easy to comprehend Germany’s tumultuous history in these years. Guest Room is a program in which filmfront invites a filmmaker, artist, friend or appreciator to introduce and lead a follow-up conversation on any film of his or her choosing, giving a personal testament to the GUEST's first and subsequent encounters with the film, asking why it is held in high esteem and why it is of essential viewing to an audience. For our first installation of the program, friend and filmmaker Ivan Villafuerte discusses the importance of Shane Carruth's 2013 American independent film UPSTREAM COLOR.